One spontaneous but productive Google search, a year of preparation, and several days of frantic packing and repacking had me stepping onto a plane with my best friend of almost 15 years on my way to Takoradi, Ghana to put my nursing skills to use. It was my maiden voyage away from home, nervous would have been an understatement but I was equally excited at the prospect of adventure. There were 30 hours of flights and layovers to make the 11,000 km journey from Edmonton, Alberta, Canada to Accra, Ghana. Before this trip came into existence I had heard of Ghana a few times, although I wouldn’t have been able to place it on a map and I certainly had never heard of Takoradi. 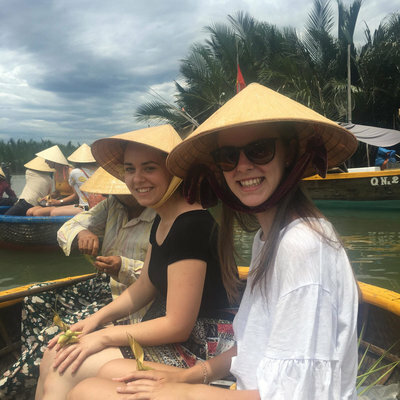 I scoured the case studies on the Work the World website and made lists of questions to ask the Work the World staff when they called to check in, so as to wrap my head around what to expect when I arrived. Despite travelling to a continent I had never stepped foot on, I was comforted by how much effort the Work the World team put into preparing me for this trip. With frequent phone calls and very prompt response to emails I was never very far from the answers to the questions I had. The one item I slacked on prior to hopping on the plane was learning a few of the Fante words that were taught in the YouTube video we were provided with. It wasn’t until I was sitting in Heathrow Airport that I finally found the time to make some flashcards and start reviewing. Even with the 6 hours of practicing, I managed to pick up a few important words but I didn’t feel confident to speak them…that would soon change though! Our last flight of the journey to Ghana was a 5 hour, 30 minute flight from Heathrow, and as we sat on the runway for over an hour, waiting for a baggage problem to be sorted out, stress was running high as we realized that we would not only be arriving in Ghana late, but in the pitch black without cell phones, internet or really the confidence to get ourselves a place to stay if Frank wasn’t there waiting for us as planned. When we landed and the plane door opened it was like stepping into an oven (especially because we left a city that still had snow on the ground!). Unfortunately the day's adventures hadn’t quite ended, it took almost 2 more hours for us to receive our bags at the airport and by this time I was convinced that we would be left all alone in the airport in Accra. As we walked towards the front doors we heard our names called out across the way. Sure enough, Frank was there with a huge smile and big hug to welcome us to the beautiful country of Ghana. The taxi ride to the hotel in Accra felt surreal: the warm wind, the outline of palm trees in the dark and the mystery of not knowing what it looked like past the car's lights. Frank took us right up to our rooms and we met 3 more Canadians who had arrived earlier in the day and, finally, the 30 hour day came to an end and our only challenge left was to figure out how to fall asleep in a room that was hotter than our hottest summer day at home! In the morning we had breakfast at the hotel and took off to a “tro-tro” station (like a bus station) to catch a bus to Takoradi. The 4-hour trip was humbling, eye opening and a preview of what we got to see during our 3 weeks in Ghana. Arriving at the Work the World house gave me butterflies, I was nervous and excited to see the place that I would call home for 3 weeks! I can say with certainty that it did not disappoint. The staff at the house went so far out of their way to make us feel at home that if I was to ever do another Work the World placement (which I desperately want to do) it would be hard to stray from Takoradi. Ophelia and Mavis did all of the cooking for us while we were there. Every weekday they would come in early and make us breakfast, and come back in the evening and make us dinner! They also left the kitchens (there is one downstairs and one upstairs!) stocked so that we could make ourselves lunches. There is a security guard at the house 24/7, which gave me great peace of mind and was a definite bonus to all of my folks back at home who were so unsure of what I had gotten myself into. One of the things I appreciated the most about the staff at the house was how they made themselves available to us at any time of day. Even when the entire household of students would leave for the weekend to travel, they would check in with us to make sure we arrived safely or even go so far as to recommend restaurants or hotels in the areas we were going. Frank and Joe took us on a tour of both the hospital and the town of Takoradi on our second day at the house. It was perfect. We got to meet a lot of the staff at the hospital that we would be seeing for the next few weeks and we also got a lay of the land. I even started to get over my fear of hailing taxis (as a kid born and raised on a farm I had only been in a taxi twice in my life up until this point so I will argue this was a semi valid fear). On this day they also took us to the market where we were able to buy phones (approx. $25 Canadian) and phone cards ($1 Canadian) so that we could text or make calls as needed- both in Ghana and internationally. These phones worked like iTunes, you could by a gift card at a vendor for a certain amount and enter it into your phone and you would get a certain number of minutes! Without much more ado than this, we were ready for our first shift in the hospital. I came on this trip after just finishing my second year of nursing school. 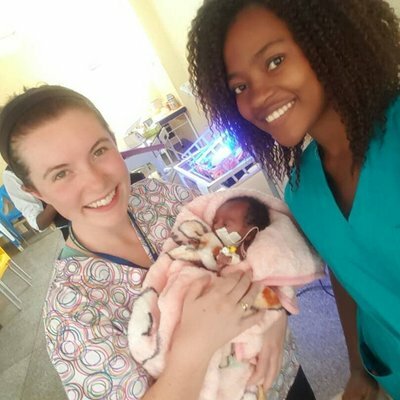 I was nervous that I wouldn’t have enough experience to be helpful in the hospital but, much like a clinical placement, we were introduced to the staff members we would be working with (especially in Labour and Delivery). The midwives in Labour and Delivery were great to work with. The more you were willing to get involved, the more they would look for new opportunities to let you help out and learn. 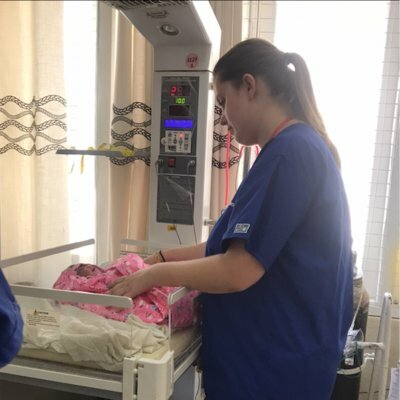 Being able to use my nursing skills in the hospital built my confidence as a nursing student and gave me the chance to learn a lot of new assessment skills on the job! Since being back at home I have been able to apply so much of what I learned and saw. Work the World in Ghana provided me with experiences both inside and outside of the hospital that I will carry with me throughout my career and my life. I would sign up to do it again in a heartbeat!